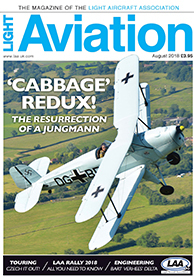 Chairman’s Chat - Steve on the positive attitudes of so many people engaged in aviation. News - The Farnborough Airspace approval, Electroflight get funding, Aston’s flying car. Meet the LAA Events - A round up of events so far and a look ahead. Projects - A plans built Pitts, Nord NC854 rebuild, and a Onex from the Netherlands. FAI art competition - LAA going great guns with a Yohng Peaoples art competition. Destination - Martin has a great weekend in Roudnice, in the Czech Republic. Cambrai Covers - It’s Cambrai’s 40th anniversary and they’ve got it covered! Rally Preview - The Rally chairman explains why it’s an event not to miss. 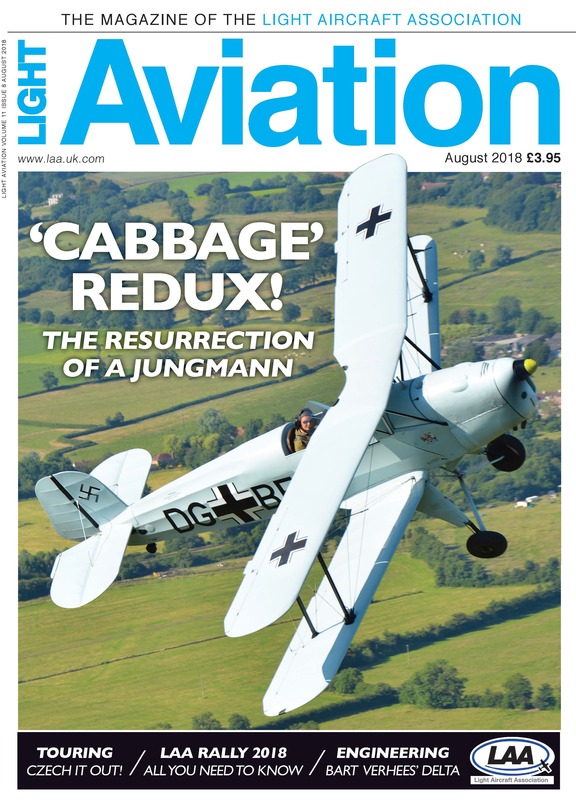 Air test - Clive Davidson and Annabelle Burroughes on rebuilding and flying a Jungmann. VW ignition - A Leburg electronic ignition conversion on a Nipper’s VW. Financial Review - Steve Slater takes a look at the audited 2017 finances. Struts 4U - A brief history of the Oxford Group, plus upcoming meetings and events. Air Courtage - What to do before, during and after an incident involving a claim. Meet the members - Ron Perry, glider pilot, Smaragd owner and LAA coach. Becoming an Alien - Bart Verhees discusses his new Delta 2. Farnborough - Steve Slater on the issues with Farnborough’s recently approved airspace. Where to Go - Plenty of options now the season is in full swing! Classifieds - Plenty of bargains to whet your appetite.